Featured Song "Rockin' the High School"
"A Little Learning" is the twelfth episode of the Super Mario World animated series. While rushing to school, Yoshi and Oogtar, carrying lunch-boxes and schoolbags, run-up to Princess Toadstool (who acts like a teacher) ringing a bell in front of the schoolhouse. While Hip and Hop Koopa watch from the bushes, Oogtar hands Princess Toadstool an apple. Taking a bite of this apple, Princess Toadstool hurls it away in disgust, as it has a small Caterpillar in it. An angry Princess Toadstool proceeds to order Oogtar and Yoshi into the schoolhouse. 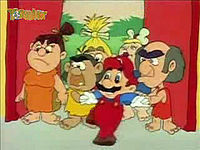 Seeing Oogtar, Yoshi and the Princess go into school, Hip and Hop try to follow them, only to be grabbed by King Koopa. The angry Koopa king proceeds to tell Hip and Hop they are forbidden to go to school, believing school will turn the Koopaling twins into "goodie two-shoes". As Koopa makes Hip and Hop promise not to go to school, he fails to notice Hip and Hop crossing their fingers as they make this promise. As Koopa walks-off, Hip and Hop zoom into the schoolhouse, just in time for the Pledge of Allegiance. After reciting their own version of the pledge, Hip and Hop are asked why they're at school by a confused Princess Toadstool; Hip and Hop give the simple reply "We wanna go to school! Except King Dad doesn't want us to!" Angry cave people who aren't appealed at the idea of having the Koopalings at school. Before the Princess can reply to Hip and Hop's remark, the school is besieged by angry cave-people, who refuse to allow Hip and Hop to attend the same school as their children. As Princess Toadstool leaves to discuss matters with the cave-people and Mario (who acts like the principal), Oogtar decides to give Hip and Hop some gum, saying that the Princess loves when kids blow bubbles in their class, the bigger, the better. After convincing the cave-people to give Hip and Hop a chance, Princess Toadstool returns to class, only to get caught in the gunk left by Hip and Hop's giant bubble gum bubble. As Princess Toadstool begins telling Hip and Hop she doesn't like gum in her class, Hip and Hop can only glare angrily at Oogtar. After reprimanding Hip and Hop, Princess Toadstool proceeds to give Oogtar and Yoshi the responsibility of showing Hip and Hop around. Later, during a game of catch at recess, Hip and Hop pop the game ball. As Princess Toadstool goes to get another ball, Hip and Hop, hungry for revenge against Oogtar, proceed to take several dozen fireballs from out of their backpack. With fireballs blazing, Hip and Hop begin throwing fireballs everywhere. Running from Hip and Hop, Oogtar becomes entangled in the school playground's jungle gym. Approaching Oogtar, Hip and Hop throw a pair of fireballs at him. Missing Oogtar, Hip and Hop instead release him from entanglement. Before Hip or Hop can hurl anymore fireballs at Oogtar, Yoshi eats the Koopaling's backpacks. After doing this, Yoshi is attacked by Hip and Hop, with Oogtar joining in the fighting shortly afterwards. Princess Toadstool, blaming the fight on Oogtar. Rushing outside, Princess Toadstool manages to stop the fighting and, believing Oogtar to be the one who started the fight, scolds him while Hip and Hop make mocking poses at him from behind the Princess' back. At Neon Castle, King Koopa begins to wonder why things are so quiet and where Hip and Hop are. Perplexed, he begins to look around his castle for his youngest children. Back at school, Princess Toadstool announces that a science fair is going to be held and advises the students to start working on their projects. As Oogtar and Yoshi work on their project, an "eggabega", a cross between an eggplant and a rutabaga, they are continually taunted by Hip and Hop. Having had enough, Oogtar begins storming over to Hip and Hop's table, only to be stopped by Princess Toadstool, who sends Oogtar back to his and Yoshi's table. While Hip and Hop work on their volcano project, Oogtar has Yoshi use his tongue to pull Hip's chair out from under him, causing Hip to fall face-first into his and Hop's volcano. After the school day is done, Hip and Hop sneak-back into the building during the night and proceed to sabotage Yoshi and Oogtar's project by sticking a Piranha Plant in it. After doing this, Hip and Hop begin modifying their volcano. Mario and Luigi as judges to the fair. The next day, Princess Toadstool begins to announce that the science fair is starting and proceeds to introduce the fair's judges, Mario and Luigi. As the students begin setting up their projects, Hip and Hop begin discussing their own project in a tunnel beneath the school. Having set-up an extensive piping system which goes from Neon Castle to the school, Hip proceeds to tell Hop how to work the pipes. Meanwhile, King Koopa, still searching for Hip and Hop, ends-up tripping over a newly placed pipe in his dungeon. Confused, Koopa begins to follow the pipe, which leads to the nearby Warp Tube to Dome City. Becoming increasingly suspicious, he jumps into the Warp Tube. At school, Hip begins to show-off his volcano project, which is quite spectacular and impresses everyone present. Oogtar, jealous of Hip's project, begins to dump excessive amounts of fertilizer on his and Yoshi's "eggabega". Unbeknownst to anyone, the fertilizer causes the Piranha Plant hidden in the eggabega's leaves to grow instead. Outside the school, Koopa exits the Warp Tube and, seeing he's at the Dome City school, instantly realizes that Hip and Hop disobeyed him. He then finds Hop next to a lever that controls the lava that flows through Hip's volcano. When Koopa picks up Hop, Hop tells Koopa that he doesn't belong here. Koopa says that he doesn't either and says to him that as he gets Hop and his brother Hip home, they will be in big trouble. However, when Koopa picks up Hop, Hop accidentally spins the lever out of control. Hip's volcano begins spurting huge amounts of lava without Hop to steady the flow. Everyone makes it out, though the school becomes destroyed by the lava. The giant Piranha Plant has also escaped and begins going on a rampage, wanting King Koopa as its meal. He, along with Hip and Hop, attempts to flee but they all get eaten the Piranha Plant. Yoshi then swallows the slowed down Piranha Plant, trapping Koopa, Hip and Hop inside him. Princess Toadstool, instructing Yoshi to spit the Koopas out. Feeling extremely bloated and sick, Yoshi is instructed by Princess Toadstool to spit the three Koopas into the Warp Tube to Neon Castle. After doing so, Princess Toadstool yells into the Warp Tube that Hip and Hop must not bother going to school (they are expelled forever). 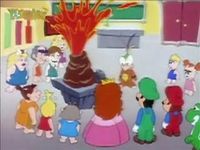 With the lava from Hip's volcano still flowing, Mario and Luigi manage to save Dome City by turning the piping system around. They shove the pipe down the Neon Castle Warp Tube and into Koopa's bedroom, flooding it with lava (which comes out of a pipe in his room). Koopa, trapped and panicking on his bed, pleads with Hip and Hop to save him with the promise that they can return to school. Right after Oogtar gives the bubble gum, Yoshi's saddle color gets reversed. When Hip and Hop puts the Piranha Plant into Oogtar's plant, the pot changes color from gray to green. Also, when the Piranha Plant is chasing them, the pot also changes to green. When Princess Toadstool says, "Here, Yoshi! ", her mouth isn't moving at all. Additionally when she says, "What did you do with it? ", her mouth only moves once then closes. When Hip and Hop are chased by Koopa during the Rockin' the High School sequence, their heads match the colors of their bodies. Before being swallowed by Yoshi, the giant Piranha Plant freezes in mid-step for a few frames. Koopa implies in this episode that he is illiterate, though he seemed perfectly capable of forging a letter in-game in Super Mario Bros. 3. Aside from screaming during the "Rockin' the High School" sequence, this is the only episode of any Mario cartoon in which Luigi doesn't have any lines. The song in this episode, "Rockin' the High School", is a parody of the Ramones song "Rock 'n' Roll High School". This is Princess Toadstool's last cartoon speaking role. Also, this is the final animation appearance of the Koopalings and Oogtar. This is the only Super Mario World episode where Hip and Hop have speaking roles. 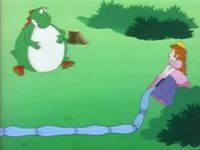 The parts of this episode leading up to the science fair can be seen as a commentary on the issue of bullying in school and how it is often ignored by adults (such as when Princess Toadstool punishes Oogtar for fighting with Hip and Hop). Chronologically, this is King Koopa, Mario and Princess Toadstool's final appearances. 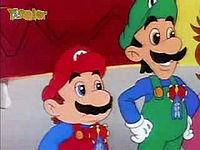 However, they do appear in the series finale, in Luigi's story set before the events of the first episode. ↑ May 20, 2015. "A Little Learning", dubbed in Romanian by KidsCo. Odnoklassniki (OK.ru). Retrieved January 4, 2016. This page was last edited on April 18, 2019, at 09:25.